Is your garden planted and now you’re waiting for everything to pop up and grow? 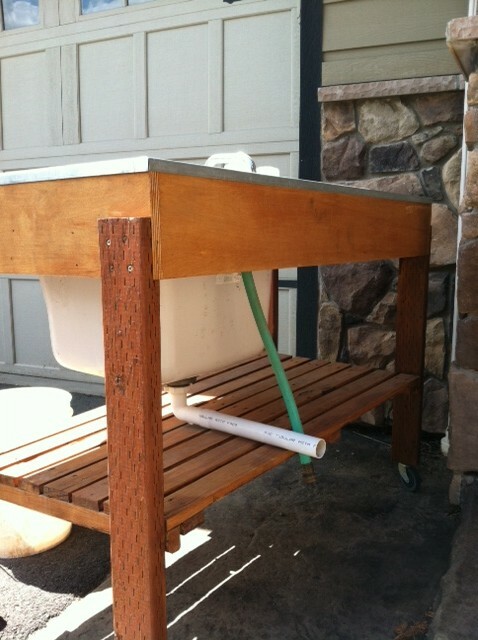 Why not build this DIY Outdoor Garden Sink that hooks up to your garden hose? After 2 seasons of full swing veggie gardening with the help of this functional tool, I’d hate to live without it. Bringing washed produce into the house ready to prepare means leaving the dirt and grit outside. The laundry sized basin sink, filled full with ice cold fresh water eases the chore of cleaning all sorts of garden fresh produce. Check out these plans my husband Jack put together, so you too can enjoy the novelty of this useful tool. 1) short length of hose to connect to a garden hose. Start by building the tabletop.Choose the sink and faucet type and cut the appropriate holes in the plywood.Position the sink as far to one side as you can to increase the work surface.If you choose to have a stainless or galvanized top skin fabricated (recommended) now is a good time to take it down to a sheet metal shop while it is easy to transport. Next cut your legs, notch the tops as shown and drill hole in bottom to receive the caster shaft.Take care to drill this hole to allow for a somewhat tight fit. Now build your shelf separating each slat by ½”. 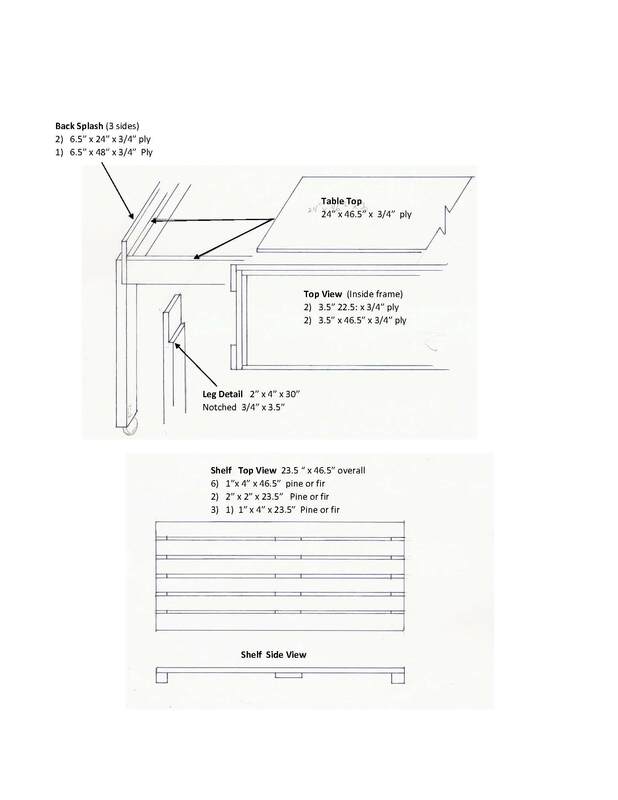 You can use three 2x2x24” to attach the slats to, making sure you are keeping the shelf square as you screw each one in place. For the final assembly turn the tabletop upside down to attach each leg with (4) 2” deck screws.Again, be sure to square each leg as you go.Insert the casters,Turn the table rightside up and attach the top edge of the shelf 11 ½” up from the bottom of the leg.This allows enough clearance for 90 degree elbow and a short drain pipe above the shelf as shown in the picture. Did the $85 charge include the price of stainless steel and the fabrication (i.e., bending steel for counter top and side splash) ? Where is this shop located? I checked with a local (West Chester, PA) fabrication shop. He recommends 16ga stainless steel; the price is around $75 and an additional $400 for fabrication. It is a beautiful table. Thank you Monty! We use our outdoor sink almost daily! It is so functional when you have a garden as big as ours. I also use it as a potting bench for repotting plants. Thank you for getting back to me. It is a beautiful table and looks very functional. My name is Jeremy Hahn, and I am employed at Chirch Global® in McHenry Illinois. Chirch Global® Manufacturing manufactures metal stamped components and sheet metal fabrications. make up our company, and you can read more at www. You can learn more about our growing Manufacturing Network at www. Any details on how to hook the hose to the faucet so you have running water…I’m trying to make something similar…do you need any adapter or will the connections just screw together? Thank you Stacey for the inquiry. You will have to match your faucet connection up with an adapter that will in turn connect to a hose bib. It is two separate brass fittings. I then attached a 2 foot section of hose with a female hose bib on each end to the faucet adapter so I could connect to a longer garden hose. 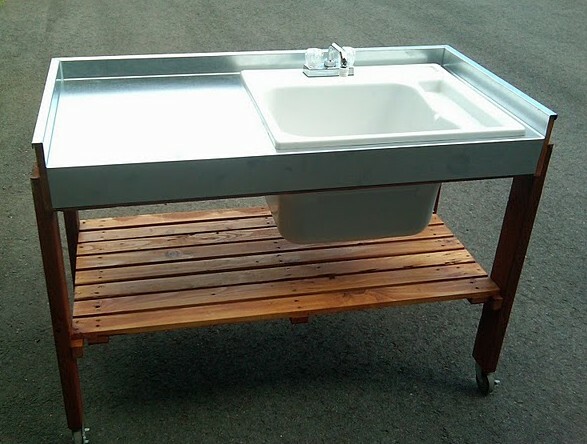 Since my sink is on casters I am able to move it around without having to haul a fifty foot section of hose or reach up to connect directly to the faucet each time we use the sink. Any building supply store like Lowes or Home Depot should carry the fittings. (We use the sink every day during the summer and fall.) If you have any other questions feel free to ask. Where does it drain to? Thank you! Glad you stopped by. Thank you! I use it at least once a day during garden season! updated daily. It includes good material. wanted to thank you for ones time just for this fantastic read!! Amazing! Its in fact amazing paragraph, I have got much clear idea regarding from this article. pleasant to read this weblog, and I used to pay a quick visit this website every day.